The linuX-gamers Live DVD was a bootable medium with a collection of popular 3D games. It contains both the NVIDIA and ATI proprietary Linux drivers and includes the following games: BzFLag, Enemy Territory, Glest, Nexuiz, Sauerbraten, Torcs, Tremulous, True Combat: Elite, Warsow and World of Padman. 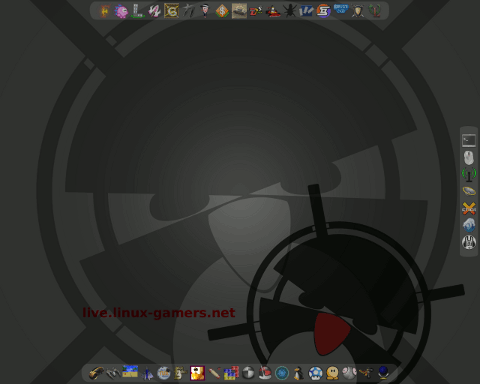 Although the live DVD was based on Arch Linux, it does not offer any desktop Linux functionality except gaming. Rate this project BlankOn Linux is a distribution created in cooperation between the Indonesian Linux User Group and the Indonesian Ubuntu community. Its primary goal is to deliver a desktop-oriented Linux distribution with full support for the Indonesian language. The latest version, 4.0 "Meuligoe", is based on the recently released Ubuntu 8.10, with Linux kernel 2.6.27 and GNOME desktop 2.24. Some of the features incorporated in the release include: popular GNOME applications, such as The GIMP, Inkscape and GnuCash are included in the default install; out-of-the-box support for MP3 and other widely-used media codecs, as well as encrypted DVDs; custom theme and artwork. The release is available in three formats: as an installable live CD, as an installation CD, and as a minimal live CD (with AbiWord and Gnumeric replacing OpenOffice.org and Epiphany replacing Firefox). Please read the release announcement and release notes (both links in Indonesian) for further information. Download the installable live CD from here: blankon-4.0-cdlive-i386.iso (676MB, MD5, torrent). Rania el-Amina has announced the release of BlankOn 10.0, an Indonesian Linux distribution based on Debian and featuring a custom GNOME Shell-based desktop called "Manokwari": "After several years of development, the BlankOn development team proudly present the 10th release of BlankOn, code-named 'Tambora'. There are many changes in this release which provides its own colors and support for new hardware. The development team has also added new features to some of the native BlankOn packages. Manokwari is a desktop environment based on GNOME Shell 3. It combines GTK+ with the HTML 5 frontend; it is an evolution from a shell called blankon-panel. In this release, Manokwari gets many updates and several new features, including updated search function, right-hand side panel, weather widget, music player and beautiful icons. Manokwari on BlankOn 'Tambora' supports higher screen resolutions, such as the Retina display and can also be used on 4K screens." Continue to the release announcement (in Indonesian, scroll down for the English version) for further details. Download: BlankOn-10.0-dvd-desktop-amd64.iso (1,428MB, SHA256). Ahmad Haris has announced the release of BlankOn 9.0. BlankOn is a modern Indonesian Linux distribution with GNOME 3 and a custom desktop shell called "Manokwari", based on Debian's "Testing" branch. New features of the release include: various improvements to the Manokwari desktop; contextual dynamic desktop; LibreOffice 4.1.4; a complete set of graphics and multimedia applications, including gThumb, GIMP, Inkscape and VLC; a new application centre called Warsis; Geo.BlankOn, a digital cooperation platform to develop cluster software and provide geospatial data (e.g. traffic congestion, flood spots or tourist information) to support a variety of computer systems; introduction of Maleo, a development tool for creating HTML 5 applications for deployment on desktop computers and mobile devices; Linux kernel 3.12.9; Chromium 31 web browser.... Read the complete release announcement (in Indonesian) for more information and screenshots. Download: BlankOn-9.0-dvd-desktop-amd64.iso (1,199MB, SHA256). 2012-10-16 Distribution Release: BlankOn 8.0 "Sajadah"
Ainul Hakim has announced the release of BlankOn Linux 8.0 "Sajadah" edition, an Indonesian distribution with a collection of Islamic software, based on Ubuntu. Some of the new features of the release include: Manokwari BlankOn desktop; QiOO - Al Quran in LibreOffice; Zekr - Al Quran translations and voice Tartil online; Minbar - prayer time reminder; Stellarium - an application to see the solar system and a planetarium; support the writing of Arabic alphabet; calculator Zakat Indonesia; Nawala DNS - a DNS domain filter; Hijra - an Islamic calendar; Monajat - a prayer viewer applet; Thawab - an encyclopedia and ebook viewer and books.... Read the release announcement (in Indonesian) for more details. Download: BlankOn-sajadah-8.0-desktop-i386.iso (1,674MB, SHA256, torrent), BlankOn-sajadah-8.0-desktop-amd64.iso (1,666MB, SHA256, torrent). 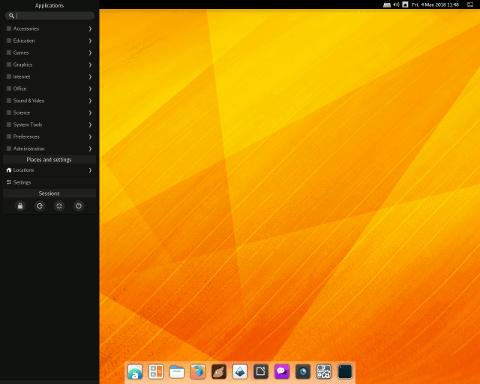 The BlankOn development team has announced the release of BlankOn 8.0, a Debian-based Indonesian distribution featuring the GNOME 3 desktop with a custom desktop shell called "Manokwari". Built with HTML 5 and CSS 3, Manokwari is an evolution from the project's earlier shell called "BlankOn Panel"; it features a standard panel with a number of common applets, as well as a comprehensive menu system for quick access to applications and utilities. Other features of this release include a new DVD edition with extra software (a CD edition is also available), support for six languages used in Indonesia, Stardict dictionary, the Chromium web browser version 21, and an online package repository developed specifically for BlankOn. See the full press release (in Indonesian) for further information. Download links: BlankOn-8.0-dvd-desktop-i386.iso (977MB, SHA256, torrent), BlankOn-8.0-dvd-desktop-amd64.iso (966MB, SHA256, torrent). BlankOn Linux 7.0 has been released. BlankOn is an Ubuntu-based Indonesian desktop distribution with support for most Indonesian languages, the two official languages of Timor-Leste (Portuguese and Tetun), as well as English and simplified Chinese. It also includes six non-Latin writing systems (Bugis, Batak Toba, Bali, Sunda, Rejang and Jawa), a StarDict dictionary for Bahasa Indonesia, and the latest Chromium web browser. Most audio codecs are playable with the help of the Exaile music player, while digital photos can be organised in the popular Shotwell program. On the hardware side, the distribution includes plug-and-play support for many popular USB modems used by Internet Service Providers throughout the archipelago. Major components: Linux kernel 3.0.1, GNOME 2.32, Chromium 15.0, LibreOffice. Read the full release announcement (in Indonesian) for more information and screenshots. Download: blankon-pattimura-cdlive-i386.iso (692MB, MD5), blankon-pattimura-cdlive-amd64.iso (679MB, MD5). 2010-08-13 Distribution Release: BlankOn 6.0 "Sajadah"
BlankOn 6.0 "Sajadah" edition is a variant of BlankOn 6.0 (also known as Ombilin), extended with Islamic content and applications. BlankOn Sajadah supports entertainment software for immediate use without installing additional multimedia codecs, Internet access with very light web browsing, communications for instant messaging and social networking, and also office software. It also features vector and bitmap graphics as well as digital photo albums, and of course provides Islamic applications such as Qur'an, Hadith, Prayer Reminders, and Negative Content Filtering. BlankOn Sajadah 6.0 is launched to help the Indonesian Muslims. Visit the homepage (in Bahasa Indonesia) of BlankOn Sajadah for the press release as well as a number of screenshots. Download: blankon-sajadah-6.0-cdlive-i386.iso (960MB, MD5). Ainul Hakim has announced the release of BlankOn 6.0, an Indonesian desktop Linux distribution based on Ubuntu with support for Indonesian languages and scripts, as well as English: "BlankOn 6.0 'Ombilin' is the newest version of the BlankOn distribution. It was developed by the Indonesian Linux Mover Foundation and BlankOn developer team. BlankOn is an Indonesian distribution that includes a variety of software that is widely used by consumers in general, such as office programs, financial applications, Internet applications, drawing (both vector and bitmap) and support for various multimedia file formats. Features: four types of scripts, namely Bugis, Toba Batak, Balinese and Sundanese; Stardict fast dictionary; Chromium web browser; Exaile music player; USB modem switch, Shotwell photo manager; support for the AMD64 architecture...." Read the release announcement and release notes (both links in Bahasa Indonesia) for further details. An English translation of the release notes is available here. Download: blankon-6.0-cdlive-i386.iso (698MB, MD5, torrent), blankon-6.0-cdlive-amd64.iso (698MB, MD5). BlankOn 5.0, an Ubuntu-based distribution designed for Indonesian users, has been released: "Today the BlankOn developer team officially released BlankOn 5.0, code name 'Nanggar'. Some of the new unique features in Nanggar are contextual desktop, with the ability to change the theme and the wallpaper of the desktop based on the computer clock or based on the current weather conditions. Another unique feature is the Aksara Nusantara project which gives the ability to write in Batak Toba alphabet. BlankOn Nanggar provides a user guide that can be downloaded from here. Features: GNOME 2.26; office applications - OpenOffice.org 3.0.1, GnuCash; GIMP 2.6.6, Inkscape 0.46, Firefox 3.0 web browser; Linux kernel 2.6.28." See the full release notes (bi-lingual in Bahasa Indonesia and English) for further information. Download: blankon-5.0-cdlive-i386.iso (677MB, MD5, torrent).